Open-hearth cooking is, quite simply, cooking over a live fire. This technique has been the dominant method of cooking since the ancient realization that fire transforms food. Surprisingly for such a basic activity, specialized tools for hearth cooking are a fairly recent phenomenon in most cultures. 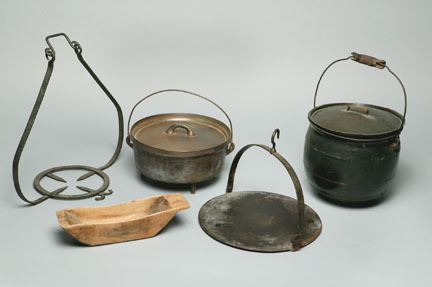 Typically, the only tools needed for cooking with fire were waterproof containers that withstood heat, and a tool with which to suspend either food or a container close to the direct radiant heat. Every culture has developed its variation on these two requirements, inventing cooking technologies based on materials at hand. Rietz seems to have collected with this fundamental idea in mind. Every culture and geographic area represented in the Rietz Collection has some example of tools used for hearth cooking. However, the majority of hearth tools in the Collection are from the domestic cooking traditions of 18th and 19th century Great Britain and North America.